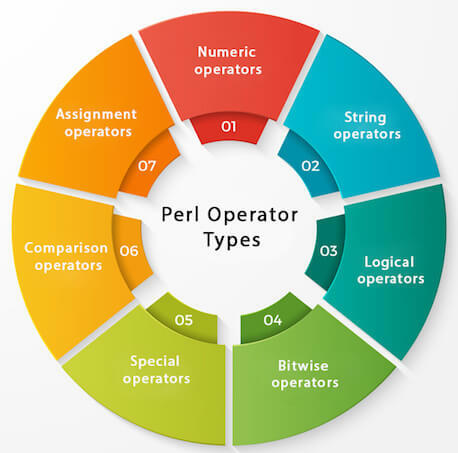 Perl operators provide values to their operands like numeric, Boolean or string, etc. To choose an appropriate operator, you need to know the value of operands. Numeric operators are the standard arithmetic operators like addition (+), subtraction (-), multiplication (*), division (/) and modulo (%), etc. String operators are positive and negative regular expression with repetition (=~ and !~) and concatenation ( .). Here, note that on the right of 'x' it must be an integer. There should be space on either side of the 'x' operator. Logical operators give a Boolean value to their operands. They are (&&, || and or). && -> In && operator, if $a is 0, then value of $a && $b must be false irrespective of the value of $b. So perl does not bother to check $b value. This is called short-circuit evaluation. || -> In || operator, if $a is non-zero, then value of $a && $b must be true irrespective of the value of $b. So perl does not bother to check $b value. Bitwise operators treat their operands numerically at bit level. These are (<<, >>, &, |, ^, <<=, >>=, &=, |=, ^=). Every number will be denoted in terms of 0s and 1s. Initially integers will be converted into binary bit and result will be evaluated. Final result will be displayed in the integer form. The auto-increment (++) operator is a special operator that increments the numeric character itself by 1. The comparison operator compares the values of its operands. These are ( ==, <, <=, >, >=, <=>, !=).